Established by the Renmark Aquatic Club, the story goes that a bet was made between a few of mates to see how fast they could go in a race between some tinnies. Word quickly spread around the town a race would be held. Anton Webb announced a ‘Punt Derby’ would be run on April 26th 1981. Looking at the club today it is hard to imagine if anyone had any idea of what it was to become. The locals hit the river and creeks to practice at every opportunity. Tight knit bonds were formed between Drivers and Navigators. Knowledge of the creek systems, snags, hidden logs and possible courses were closely guarded. 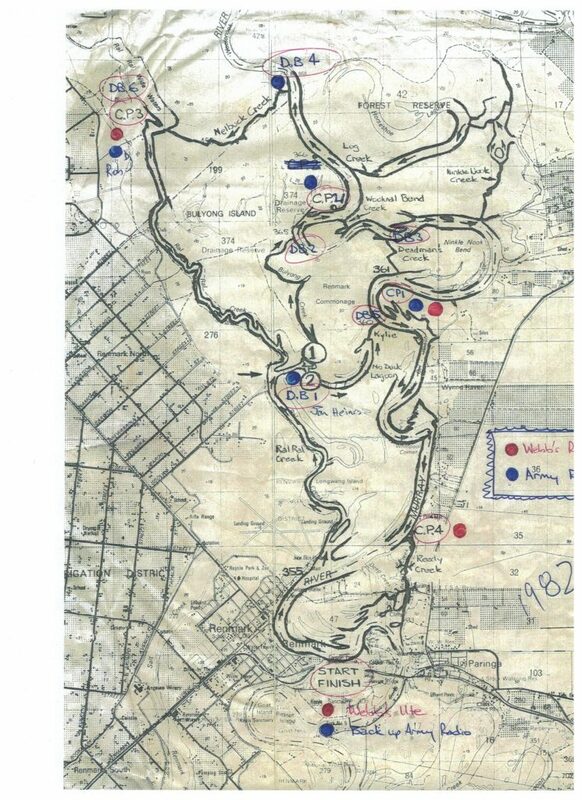 The exact course was unknown to the competitors who received the course maps at the commencement of the race. The maps were a paper copy and did not last long under race conditions. 4 Classes of Motors were eligible to compete in the first race. Up to 15PH, 9.1 to 14.9HP, 15 to 20HP and 20.1 to 30HP. The course commenced at the Ski Club Site to Kylie Creek, Bulyong, Nelbuck, Wide Waters, Bulyong and return to Ski Club Site. This race and many race events to follow were not for the feint hearted. It was as much a test of stamina and physical fitness on land as it was boat design, propellers and speed. Aquatic Club members worked tirelessly to organise the first event. Much thought went into the exact course, how to indicate the course to the racers, how to keep the course discreet until the actual race day. Everywhere you went you could hear people discussing exactly where the course may run and why. Local sponsors were sought for financial assistance to the race, with the average donation being between $10 and $50. The race was heavily supported by local businesses in the township of Renmark and Paringa. Sponsorship also covered the cost of prizes. A silver mug, costing $10.74 plus $2.60 engraving was presented to the winning driver and navigator in each class with second and third place positions receiving a bottle of wine. The Out Right Winner of the race (fastest overall time) was presented with a handmade wooden trophy and stainless steel propeller. 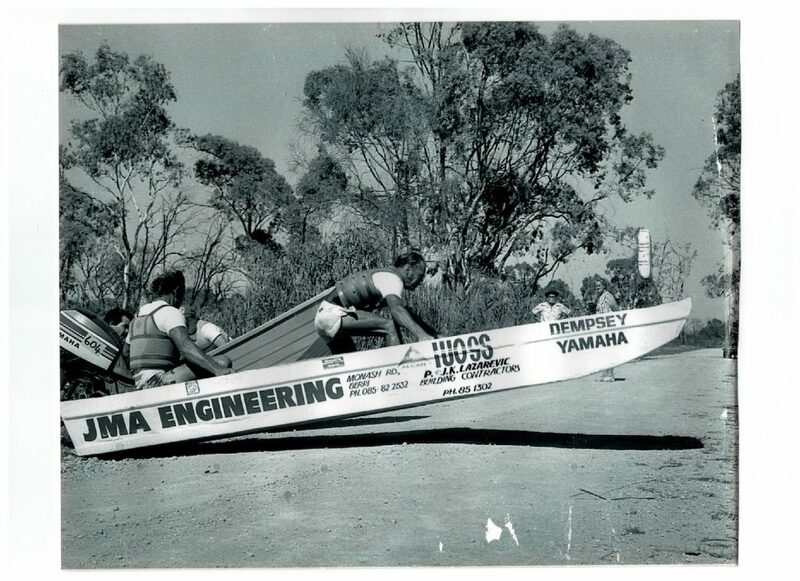 38 Boats entered from Adelaide, Mildura and the Riverland to race in the first year, boat length ranged from 8 foot to 14 foot, the race entry fee was $5.00 per boat. 1982 Mr Anton Webb with 47 Volunteers plus 10 Apex Club Members catering, ran the race with borrowed radios from the Army. 55 entries were received and the maximum damage was not over $50 to any one boat. The course was 47 KLM for the open class and 30 KLM for the lesser power boats. It is not hard to see that the competition stepped up this the second year of the race. Reported in the local paper, one boat overturned, 1 lost 11 Sheer pins, one climbed an inclined tree and many drivers found that dinghies do not travel well on land. Boats had to navigate a winding course through creeks near Renmark with their way blocked by snags, fallen trees and areas so shallow that it was manpower not horse power which counted. A causeway on one creek had to be crossed in two places, hard work for the crews with the larger outboards. Some of the hardest work for the crew was in Deadman’s Creek where two 25 metre stretches of reeds in shallow water had to be crossed. Dinghy Derby established itself as a major event on the Riverland Calendar; the race took place on February 20th and was very similar to last year’s event. The Power Craft Magazine by Australian Sea Spray ran a small article on the derby in their January 1983 Edition. The local paper reported – In the 25HP Open Class the team of Peter Lazarevic and Greg Knight finished the 50 KL Course in only 57 minutes taking several minutes of the previous year. Lazarevic also won the class last year with Tony Brown. The derby certainly lived up to its expectations and the organising and sub committee of the Renmark Aquatic Club should be proud of their achievements. 82 Teams entered this year’s race. This year’s race was held on Sunday 12th February with an increase in competitor fees to $6.00 per boat. Also the first year of computerised records. 5 Entries were received for the derby with teams from the Edinburgh Air Force Base, Adelaide, Swan Hill, Whyalla, Adelaide, Mildura and the Riverland. These proved no match for Peter Lazarevic and Greg Knight making this Lazarevic’s 4th title. QUOTE OF THE DAY from the media: Helmsmen, iron jawed and glassy eyed, fought fatigue and concentrated single mindedly on the task ahead as they tackled the physical course of land and water. In 1984 a questionnaire was undertaken by drivers and navigators. All boats should be scrutineered before they leave. It has come to my attention that one boat carried a quantity of alcohol during the race. Just keep telling me it was good fun, just in case I forget. More scrutiny of winning boats to make sure they are in correct class. Reigning Champion, Peter Lazarevic did not enter due to his involvement in speed boat racing, and this left the door open for Riverland Dinghy Derby runners up for the past 2 years John Chigros and Kym Reed to win the Derby. Crowd numbers of 300 saw the race commence with hundreds more lining the banks and creek to see the daring young men weave their way through the river and its backwaters. The course was harder with more long lifting stretches and more boats trying to fly across land. Entry fees to race $8.00 per boat.